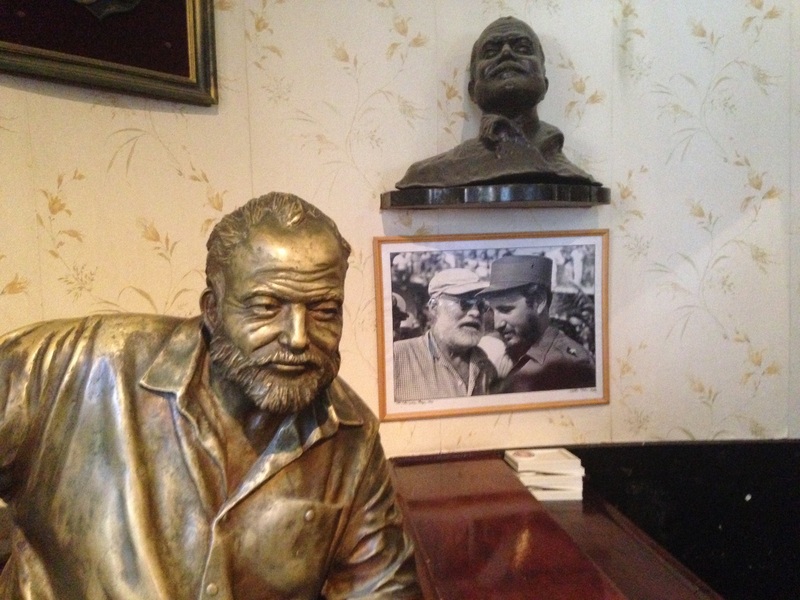 The Ernest Hemingway Hemingway’s Cuba Tour is ideal for writers, librarians, teachers, professors or anyone interested in Ernest Hemingway. In addition to visiting his home in Cuba, where he resided longest, the original Sloppy Joe’s, his favorite drinking holes and Cojimar, the small fishing village for the basis of Old Man and the Sea. 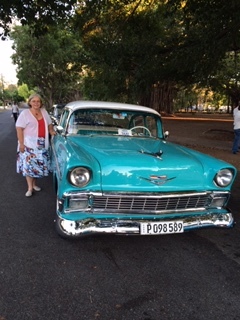 You will visit the Cuban tobacco area, ride in vintage American cars, enjoy a private cooking lesson and a discussion with a Cuban Hemingway scholar. You will be accompanied by Pam Tomka, retired Washington IL public library director who has traveled to Cuba and Dan Rutherford, President of Global Relations Travel Club who has been to Cuba scores of times. Depart to Havana via your arranged flights. You should plan arriving Havana by early afternoon. It may take you some time to clear Cuban immigration, get your bag and go through customs. You will be met in the arrival hall, after clearing customs, by our Cuban representative holding a ‘Cuba Explore’ sign to take you to your hotel. They will have your name and will be monitoring your flight arrival in case there is a delay. We will send you your guide’s name and photo closer to your departure from the States. Your first tour activity will be dinner and your guide will finalize details with you. On departure you will be asked to be at the airport 3 hours in advance. Arrival at Havana’s José Martí International Airport. Proceed through Immigration, collect your bags and go through Customs, giving them your blue customs form. Participant’s arrival times will vary throughout the day. Airport transfers will be arranged for each flight of arriving participants. Havana’s International Airport arrival hall does have bathrooms. They may not have seats or tissue. This is normal in Cuba, so you may wish to bring packets of tissues. It is suggested to use the restroom on the flight before landing. Give your ‘Health’ forms to the nurses in white uniforms after you go through immigration & screening. The important question they will ask is if you have been in Africa and exposed to Ebola. You will be welcomed at the airport exterior lobby by your guide after you exit Cuban customs. Look for signage of “Cuba Explorer.” They will have your flight number and arrival time and will be waiting for you. Victoria Hotel Havana check in with assistance from your guide. The Victoria was built in 1928 and today is in the heart of the vibrant Vedado area of Havana. (Included) The Victoria is the sister hotel to the Capri, just a short walk away. You will have access to the Capri fitness center and rooftop swimming pool. Free time to settle in and get oriented with your hotel. As you stroll through the historic cobblestone streets, you will also see the area Ernest Hemingway would walk when he stayed in Old Habana. Visit the cigar shop La Casa del Habano at the Conde de Villanueva boutique hotel, which may be the best cigar shop in Old Havana. It is hidden on the mezzanine which was once slave quarters. Cigar aficionados can enjoy the patio with its vegetation, mahogany rocking chairs and peacocks. The building was the colonial mansion of the Count of Villanueva, leader of the creole Havana society in the 19th century. Cathedral Square, the most beautiful and private 18th century colonial plaza on the island. Named after the masterpiece of Cuban baroque architecture: the Catedral de San Cristóbal de la Habana, was built by the Jesuit order. Palacio de los Capitanes Generales is the former seat of colonial government. Today the building houses the Museum of the City. Palacio del Segundo Cabo (Palace of the Second Lieutenant) dates from 1770. Today it houses the Center for the Interpretation of Cultural Relations Cuba-Europe. Visit the Museum of Chocolate, a small shop with intriguing artifacts relating to the history of chocolate production in Cuba. You can watch chocolates being made at the back of the premises while you sip a warming cup of hot chocolate or a soothing glass of cold chocolate. The Museo del Chocolate also sells artisanal chocolates singly or boxed. You will continue on to San Francisco Square, one of the oldest plazas in the historical quarter. The square is named after magnificent Iglesia y Monasterio de San Francisco de Asís dating from the 16th century. The basilica is a striking example of Cuban baroque architecture. Then on to Plaza Vieja, the only civic square of colonial times. Absent are churches and government buildings and is in contrast surrounded by opulent aristocratic 17th century residences. After the walk: Your guide will let you know some evening entertainment options for your personal exploring. Much of the inspiration for The Old Man and the Sea came from Hemingway's time in Cojimar. La Terraza is a fisherman’s bar on the Bay of Cojimar where Hemingway docked his boat, Pilar. The bar is where he spent many an afternoon drinking with the fishermen, one being Gregorio Fuentes, the Captain of Pilar. Many believe him to be the model for the character Santiago—the old man of the sea. Some say the young boy in the story, Manolo, was based on the young son of the owner of La Terraza, Manolito. Dinner (Not included). Evening is free to visit the vibrant plazas of Old Havana. Visit one of the many cafes within easy walking distance of your hotel for a snack or dinner. Your hotel location puts you in a comfortable and easy walk to live music, cafes and coffee shops. Your guide will be of help to let you know about local entertainment options. Morning departure to the western agricultural province of Pinar del Río. In route you will have a discussion with your Cuban guide about the distribution of food to restaurants (lobster), the slaughter of the cattle and the food ration book for Cuban citizens. Drive through the picturesque Viñales village in the heart of Cuba's prime tobacco growing region. The town itself sits in the center of a flat valley surrounded by stunning formations known locally as mogotes. They are irregularly shaped steep-sided hills that can rise as high as 985 feet and have bases as much as a mile in length. The mogotes were once underwater and during the Jurassic Age, about 200 million years ago, they were the first formations to emerge from the Atlantic Ocean during the creation of Cuba. Many consider this the most beautiful nature spot on the island. Late lunch at private restaurant Balcón del Valle (Balcony of the Valley and you will see why when you get there), one of the most spectacular views of the entire trip. (Included) You will have the opportunity to visit the kitchen, chat with the cooks preparing food over charcoal fire and see the hog pens in the back; it is rustic and wonderful. Check into the newest Hotel in Vinales. Hotel Central is in the heart of the small colonial town and its privileged location allows easy access to the main square. Private check-in with assistance from your guide. A short walk from your hotel is a small grocery store you may visit to see some of what locals may purchase and an opportunity for you to get bottled water, rum, coffee and snacks. Morning (Optional) Activities: horseback riding in the valley of the National Park (highly recommended). Visit the open air craft market a few blocks from your hotel, amongst the brightly colored buildings, shops and church. Experience small town Cuba. Dinner (Not included). Evening is free to take a stroll in the colorful small town of Vinales, all at the doorstep of your hotel. There are several privately owned restaurants and cafes in close walking distance to choose from. Hotel Nacional check-in; relaxing time to visit the garden, walk the site depicted in the Godfather Part II movie, enjoy a cigar, a mojito or have a rest on the veranda where some of the world’s most interesting personalities’ have taken a break while the winds from the Straits of Florida breeze by. Enjoy a welcome cocktail (Included) after your private check-in with assistance from your guide. Dinner (Not included). This is a perfect evening to explore Cuba’s famed paladares or visit one of the many cafes within easy walking distance of your hotel. Evening is free to enjoy the jazz clubs in the area, relax in the garden of Hotel National or enjoy a Cuba Libra. Visit Club Havana, a private membership club on the Straits of Florida for dignitaries, foreign diplomats, correspondents and affluent locals. The 1928 mansion once housed the Havana Biltmore Yacht & Country Club. The club attained further notoriety when it denied entry to Dictator Cuban President Fulgencio Batista in the 1950s because he was ‘black.’ Fidel Castro had dinner there 30 years later; it is one of the few places where he dined in public. Evening is free to explore the sights and sounds of the city. It is your last night in Cuba so enjoy! Depending on the time of your airline departure you may enjoy a relaxing early morning swim in one of the pools or a walk along the Malecon (seawall) with the Straits of Florida next to you. Airlines recommend you be at your departure airport 3 hours before takeoff. Please prepare accordingly. Your guide will meet you in the lobby of your hotel. After you clear Cuban Immigration, you will be screened and your carry on will be scanned. In the departure hall there is a duty free shop, places to buy snacks and drinks, as well as souvenirs. There is a currency exchange in the departure hall (1) if it is open and (2) if they have USD $ to exchange for you. They do not take CUC coins. When arriving to your U.S. entry airport you will need to clear U.S. Immigration and U.S. Customs. If asked by an Immigration Officer about your trip to Cuba, note that you were on a sanctioned Tour. If asked what you did, tell the truth and explain it was an opportunity to directly engage with Cuban people, learn about their life and country. To be clear: You were not on a vacation. As a Global Relations Travel Club (GRTC) member, leadership will make available a teleconference to go through the itinerary, answer questions and offer suggestions. As a GRTC member you will receive a series of briefing e mails before departure to assist you in preparing for the trip. All taxes; amounts are quoted in US dollars. Fly to Cuba and you will be met at the airport for transfer to your hotel. On your last day of the tour the transfer to the Cuban airport is included. Airport departure tax from Cuba and the mandatory Emergency Cuban Medical Insurance coverage during your island stay will be included in the cost of your airfare. GRTC Team will be of assistance if you have questions. Hotels in Cuba as listed in tour itinerary, or similar. All breakfasts, lunches and dinners as per itinerary. Air-conditioned coach transportation and a Cuban professional driver dedicated to your group. Cold bottled water on board. An expert Cuban English-speaking guide and serving as interpreter, along with a GRTC Team member from the U.S accompanying your tour. As a GRTC member you will receive ongoing travel support from the Global Relations team before and after your stay. Emergency collect call access to the United States while in Cuba. Global Relations Travel Club (GRTC) $29 life time membership is not included http://www.globalrelations.us/membership.html . Membership is a requirement, by Rule, to participate in GRTC tours. Airfare is not included; you select your commercial flights and book them to and from Havana. Flight reservations are your responsibility. GRTC Team will be of assistance. As a GRTC member you will have expedited processing of the needed Cuban Visitor Visa at the standard price of $85, not included, with no fee for shipping and handling. Information will be sent to you. Gratuities for Cuban tour guide, coach driver, chambermaids, restaurant staff, porters, etc. of group activities are not included. You will be asked to participate in a ‘gratuity collective’ of $154.89 from which all gratuities for group activities will be paid on your behalf. Details will be sent to you.